The second deal of Christmas is debuting tonight in the shop! It's a Limited Edition ETTA style twirl skirt, "The Nutcracker SWEET"
Your girl's Holiday wardrobe isn't complete without a twirly, Daydream Believers skirt in a fun print! This year's skirt is available in two styles: single layer for little babes (size 3m-12m) and double layer for toddlers and girls. The double layers create maximum fullness that is comfortable to wear. The bright Nutcracker print is paired with a classic red for a look that is easy to dress up or style casually. Skirt features a flat front waist with enclosed elastic in back. Skirts will be available to purchase Sunday 11/13 at 7:00 EST, IN THE SHOP. 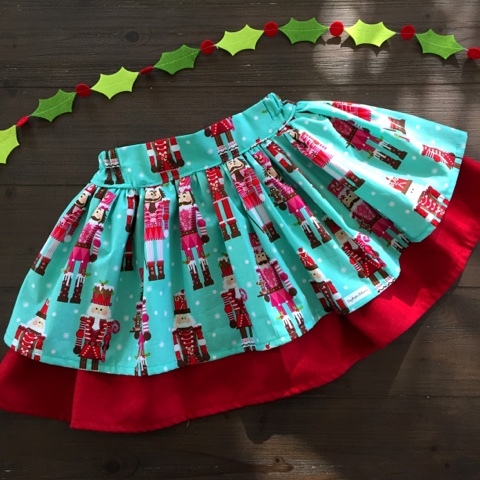 I wish I had seen the post before Christmas because I really like the skirt. Thank you. It looks great! Also, visit handmade writings and have a look at our educational blog or order the best custom papers from the professional writers.